We make it easy to apply online and get approved fast. Looking to make your money work for you? Our personal money market accounts offer competitive rates. Check your balance and recent transactions without logging in. Banking has never been more convenient. Open an account, add features to your account, and access a variety of helpful tools and resources. You can do it all online, today. With strong community values, personalized service, and a wide range of offerings, it's no surprise we've won the loyalty of so many customers. Plus, as a mutual bank, our focus is on you, not shareholders. 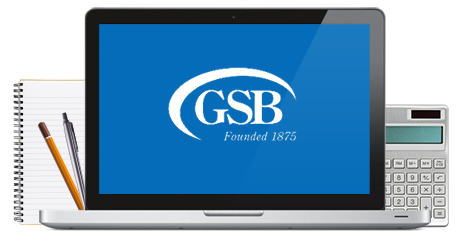 Make the switch today and find out what sets GSB apart from other banks.